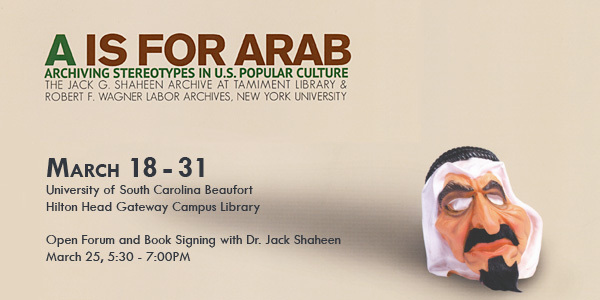 USCB is proud to host the exhibit “A is for Arab: Archiving Stereotypes in U.S. Popular Culture,” courtesy of the Jack G. Shaheen Archive at the Tamiment Library and the Robert F. Wagner Labor Archives, New York University. The exhibit will run from March 18th – 31st at the Hilton Head Gateway Campus Library in Bluffton, and is open to the public. Visit the library’s contact page to see open hours. On Monday, March 25th from 5:30 – 7pm, Dr. Jack Shaheen will join us in Library 237 for a talk and discussion on the archives and his life-long work fighting all kinds of stereotypes, regardless of race. Dr. Shaheen will also be available to sign the book associated with the exhibit. Shaheen is the leading expert on Arab stereotypes in Hollywood films, television shows and elsewhere in popular culture. He is the author of four books: Nuclear War Films; Arab and Muslim Stereotyping in American Popular Culture; The TV Arab; and the award-winning book and film Reel Bad Arabs: How Hollywood Vilifies a People. He is a member of the AANM’s National Advisory Board, and co-hosted Arab Images on Film on cable TV’s Turner Classic Movies in June 2011.